Sophisticated and picturesque, “The American Riviera” is also a fantastic vacation destination for families. Long known as one of California’s premiere coastal vacation towns for adults, Santa Barbara offers endless adventures for kids, too. And really, what’s not to love: the year-round Mediterranean climate, palm tree-lined, south-facing beaches, red-tiled Spanish Colonial-style architecture, and abundance of big city amenities. After all, this town is where Oprah Winfrey chose to take up residence! The Santa Barbara Trolley Tour is a great way to be introduced to the city. Buy tickets online and hop on and off anywhere along the route. The drivers are entertaining and share lots of local history. Cost: Adult $22; one child is free with each paying adult; additional child $8. Plus, passes are good for two days! Or use the Downtown and Waterfront Electric Shuttle which provides 50-cent rides along the waterfront or downtown to restaurants, shopping, and shows. KidTripster Tip: Your Santa Barbara Trolley ticket also gets you discounts at several attractions, including the historical museum (free! ), Wheel Fun Rentals, and the zoo. KidTripster Tip: The trolley stops at the Santa Barbara County Courthouse, an iconic city landmark (1100 Anacapa St.). The best 360-degree views of Santa Barbara are seen from the 85-foot courthouse clock tower. Climb the stairs or take the elevator to the observation deck. The tower is open from 8 a.m. to 4:45 p.m. daily. It’s free! Developed especially for kids, The Wolf Museum of Exploration and Innovation (125 State St.), or better known as MOXI, opened its doors in 2017. Famed architect Barry Berkus designed this impressive three-story building, centrally located next to the Amtrak station. Kids are in their element at this 17,000-square foot, hands-on science and technology museum. Step inside and strum a giant, 24-foot long guitar, create an enormous selfie at Mosaic Faces, and race your own self-built car down a track, complete with video replay at the finish line. The rooftop Sky Garden with incredible views of the harbor and mountains has an interactive water feature called Whitewater that parents will enjoy as much as kids. Good thing there are handy, outdoor blowers to dry off! Cost: Youth (2 & under) Free; Youth (3-12) $10; Adult $14. Located on 17 acres in a neighborhood behind Old Mission Santa Barbara, families have been visiting the Santa Barbara Museum of Natural History (92559 Puesta del Sol) for decades. My kids gravitated to the butterfly pavilion, planetarium, nature trail along Mission Creek, and Eyes in the Sky which features seven birds of prey adopted from rehabilitation centers. Cost: Youth (under 2) Free; Youth (2-12) $7; Youth (13-17) $8; Adult $12. At the Santa Barbara Museum of Natural History Sea Center (211 Stearns Wharf), touch swell sharks and rays in Shark Cove and sea stars, anemones, and crabs in the Intertidal Wonders touch pool. Cost: Youth (2 & under) Free; Youth (2-12) $6; Youth (13-17) $7.50; Adult $8.50. KidTripster Tip: If you plan to visit both the Sea Center and the Natural History Museum, buy a discounted pass. One of America’s best, smaller zoos is the Santa Barbara Zoo (500 Ninos Dr.). Home to more than 500 animals including gorillas, elephants, California condors, and snow leopards, the 30-acre zoo is easily navigated; there’s even a 12-minute behind-the-scenes train ride (Cost: $6). My family always makes a beeline to the terrific giraffe exhibit around lunchtime to feed lettuce to Michael, the most genetically-valuable Masai giraffe outside of Africa. Watch here. Cost: Youth (under 2) Free; Youth (2-12) $10; Adult $17. KidTripster Tip: Want to (sleep)walk on the wild side? Three times each summer, the zoo offers Safari Sleepovers. Your family can camp overnight next to the lion exhibit, talk with the zookeepers, and eat breakfast at the zoo. Cost: $70/person. Head for the Santa Barbara Harbor for all things related to the sea. Watch fishermen unloading their catch, buy fresh seafood off the boat, stroll out on the breakwater or dine at one of the harbor’s many restaurants such as On The Alley, Chuck’s Waterfront Grill or Shoreline Beach Cafe. Families with older children may enjoy renting stand-up paddleboards or kayaks or booking a sunset cruise. But the happiest boat in the harbor is Lil’ Toot, Santa Barbara’s original waterfront taxi. With a smile on its bow, Lil’ Toot sails between the harbor and Stearns Wharf from noon to 5:45p.m. One-way cost: Youth $1; Adult $5. Surf culture is real in Santa Barbara. If your children want to catch some waves and gain confidence on a surfboard, iSurf offers private lessons and surf camps for kids, ages 4 and up. One-person private lesson cost: $100; two-person private lesson cost: $140. Santa Barbara’s paved beachside bike and footpath, the Cabrillo Bike Path, stretches along Cabrillo Boulevard from the Harbor to Butterfly Beach in Montecito. We rented a four-person double surrey from Wheel Fun Rentals (23 E Cabrillo Blvd.) near Stearns Wharf and pedaled for almost two, really fun hours along the ocean. To be honest, my husband built up the most sweat equity. Double surrey cost: $38.95/hour; other bikes are also available. One of the most extraordinary places in the Santa Barbara area is Ganna Walska Lotusland. This phenomenal, 37-acre botanical garden in nearby Montecito is home to more than 3,000 plants from all over the world, some priceless. The estate’s cycad garden is one of the most extensive in the world, lotus flowers bloom in summer at the gorgeous water garden, and the topiary garden is stunning. Lotusland is open for two-hour guided tours from mid-February to mid-November; reservations are required. Regular tours are appropriate for children, ages 10 and over; ask about family tours. Call (805) 969-9990. Cost: Youth (under 2) Free; Youth (3-17) $24; Adult $48. KidTripster Tip: Santa Barbara County is home to three of California’s 21 original missions: Old Mission Santa Barbara, Mission Santa Inés in Solvang, and La Purisima Mission State Historic Park in Lompoc. All are open daily for tours for a small fee and probably best suited to older kids. America’s original celebrity chef, Julia Child, called Santa Barbara home and frequently dined in the local restaurants. She was especially fond of the authentic Mexican food that is so plentiful in Santa Barbara. One of the city’s most popular Mexican restaurants is Los Agaves with two Santa Barbara locations (600 N. Milpas St. and 2911 De La Vina St.) Our family shared a basket of tortilla chips and sampled the salsa bar, while sipping bottles of Mexican soda and margaritas. The standout entrée was the outstanding Agaves Enchiladas - fresh halibut, shrimp, red pepper, and onions, topped with a rich chipotle sauce and served with a rice pyramid and a vibrant salad with mango dressing. Our server kindly took custom orders from my children, who wanted something simpler - shredded chicken and bean burritos. The Funk Zone, a soulful neighborhood east of State Street and near the waterfront, is an eclectic mix of art studios, industrial lots, wine and beer tasting rooms, and eateries. Here, you’ll find the pizzeria/coffeehouse called Lucky Penny (127 Anacapa St.). The building alone is worth the trip; the exterior is covered in pennies - 164,465 to be exact! It took their team six months to hand-glue every cent. Lucky Penny’s wood-fired oven was custom built by hand in Sicily. The innovative Milpas pizza is topped with fingerling potatoes, Mexican chorizo, spicy tomatillo marinara, cotija cheese, cilantro, and a sunny-side up egg. My daughters gobbled up the less complicated LP Kids Pizza with mozzarella and marinara sauce. Also in The Funk Zone, plan to visit the very special Helena Avenue Bakery (131 Anacapa St.), located in a beautifully-restored, historic warehouse. Here organic breads and pastries are baked from scratch daily. My girls were delighted with the strawberry-glazed donuts and hot cocoa. I savored every bite of my egg and cheddar buttermilk biscuit with heavenly house-made tomato jam. Customers can watch the busy bakers through glass walls. After breakfast, the bakery’s Picnic Counter sells gourmet salads, sandwiches, and cheese boards, in addition to quiches, pastries, and pies. Award-winning Iron Chef Cat Cora and friends recently opened Mesa Burger (315 Meigs Rd. ), located a couple of miles from the harbor. The 100% Angus gourmet burgers are served on locally-baked brioche buns. The huge, farm fresh salads are excellent, too; sauces and dressings are made from scratch. The décor has a cool, surfer vibe with photographs of local beaches on the walls and televisions showing surfing competitions. Mesa Burger offers a kids’ menu and serves local beer and wine plus Santa Barbara-made McConnell’s ice cream. Or you can go to legendary McConnell’s Fine Ice Creams (728 State St.) in downtown yourself for the widest and yummiest selections. 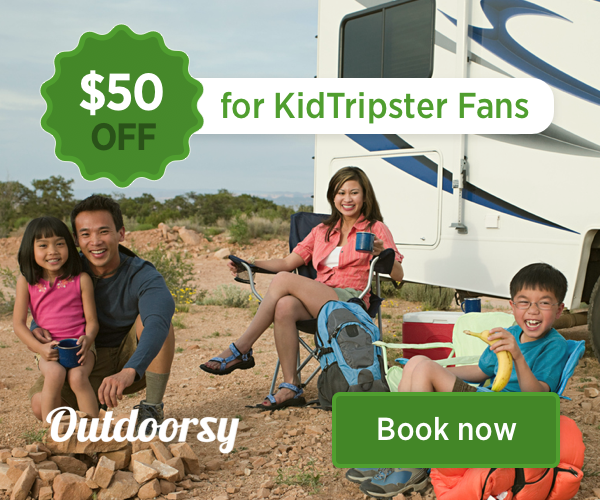 KidTripster Tip: Want some variety? Check out the Santa Barbara Public Market at the corner of West Victoria andChapala. It’s a contemporary urban marketplace, offering a wide range of cuisine under one roof - from a beer garden to noodle bowls to organic ice cream. The majority of Santa Barbara’s hotels, motels, inns, and resorts are located, understandably, near the waterfront. Hilton Santa Barbara Beachfront Resort (633 E Cabrillo Blvd.) is one of the best all-around options when staying in Santa Barbara. The beautiful, 24-acre property, formerly known as The Fess Parker, is ideally located overlooking East Beach. Hilton recently completed a $16-million renovation to the hotel’s 360 rooms, restaurant, meeting rooms, and lobby. Hollywood actor−turned real estate developer and vintner, Fess Parker, star of Daniel Boone and Davy Crockett, built the hotel in 1986. The impressive, mission-style resort has 338 guest rooms and 22 deluxe suites, several restaurants, a wine tasting room, tennis courts, a pool, a 9-hole putting green, and bicycle and in-line skate rentals. Room rates start at $267/night. Our spacious room had a large, ocean-view balcony, where we shared croissants, yogurt parfaits, and coffee each morning and watched the sun set over the Pacific each night. The well-trained, hospitable staff made our stay so enjoyable that during dinner at the resort’s The Set restaurant and lounge on our last night in Santa Barbara, my daughter exclaimed, “This was the best vacation ever!” The fact that the kids swam six times over the course of three days (even in the rain) in Fess Parker’s Olympic-sized swimming pool may have had something to do with her enthusiasm. KidTripster Tip: Santa Barbara’s million dollar views come at a price. Rooms are especially in demand during summer and command high rates. Book your hotel stay early! AutoCamp is a fun option for adventuresome families, who also appreciate the finer things! Six new Airstream suites make up AutoCamp’s urban campground, which is within walking distance to Old Mission Santa Barbara. AutoCamp recently replaced their vintage Airstreams with new ones. When we stayed at campsite #4, our family shared a 26-foot, 1962 Airstream Overlander with a full bed and a pull-out bed for the girls to comfortably share. We had a modern kitchen, beautifully tiled stand-up shower in a cleverly-appointed bathroom, spa bathrobes and bath products, a live orchid, electric grill, and Adirondack chairs on our patio, plus three complimentary beach cruiser bicycles (and helmets) for us to use. We happily discovered a drawer under the bed containing board games, so we spent a pleasant evening outside, playing "Beat the Parents" by battery-powered lantern, listening to music, and watching the fog roll in - instead of playing on our iPads. Success! AutoCamp requires a two-night minimum stay on most weekends. Each trailer is unique; most of them accommodate four people. Rates range from $164 to $227/night. KidTripster Tip: While most of the campers barbecued for dinner, we didn’t cook during our stay (besides brewing the complimentary, locally roasted coffee). There are so many great restaurants within a block or two on De La Vina Street. Try the terrific neighborhood brewpub with patio dining, Yellow Belly Tap (2611 De La Vina St.), and the healthful cafe, Our Daily Bread (2700 De La Vina St.). Beautifully situated on the southern end of California’s Central Coast, Santa Barbara is easily accessible, whether you arrive by car, plane, train, sailboat or cruise ship. Highway 101 runs through Santa Barbara, connecting Los Angeles, an hour and a half drive to the south, and San Francisco, five hours to the north. Santa Barbara Airport (SBA) is just seven miles west of downtown. The small, expedient airport touts, “Easy come. Easy go,” making it easy to return. Wendy Thies Sell resides in Santa Barbara County with her husband, children, and high-maintenance puppy, Lombardi. She keeps busy emceeing philanthropic events and writing about wine country life. This writer received a complimentary stay plus some complimentary activities and meals for the purpose of this review. However, all opinions expressed are solely her own.